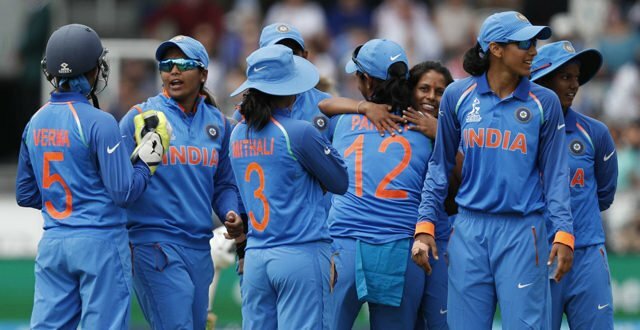 BBC- India made it two wins from two matches in Group B at the Women’s World Twenty20 with a comprehensive seven-wicket victory over Pakistan in Guyana. Pakistan were soon reduced to 30-3 but India spilled five chances and Bismah Maroof (53) and Nida Dar (52) put on 93 within 12 overs to help them to 133-7. But Pakistan were twice penalised for batters running down the centre of the pitch and India were gifted 10 runs. Mithali Raj hit seven fours in her 56 as India won with six balls remaining. After a stunning pick-up and direct hit from 18-year-old Jemimah Rodrigues claimed the second wicket, India then suffered a series of fielding blemishes. Dar was dropped on 15 and again on 29, and Maroof enjoyed some good fortune on 28 when a gentle top-edge spooned over the umpire’s head but was allowed to drop to the ground after bowler and fielders left it to each other. She took full advantage, soon reaching her seventh T20 international fifty. The first five-run punishment was enforced in the 18th over and, after Dar reached her maiden international T20 half century with a six when the fielder stepped on the rope at deep mid-wicket boundary, she was caught at extra cover next ball. Pakistan thought they had scrambled a run off the final ball of their innings, their highest World T20 total, but formidable umpire Sue Redfern, the former England international, informed them that in running down the line of the stumps again they had incurred a second penalty. It meant India effectively began their innings on 10-0 and Raj calmly recorded their fifty with successive boundaries in the eighth over. India’s leading T20 runscorer Raj was caught in the deep with only eight needed, but they soon sealed victory and will seek to maintain their perfect start when they play Ireland on Thursday.